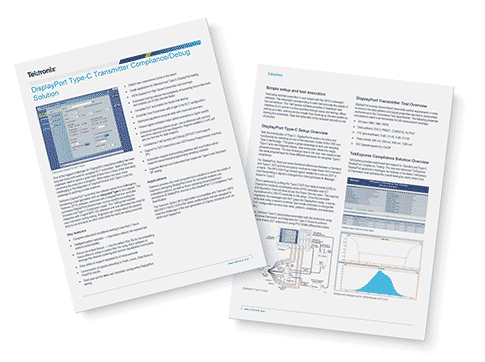 Tektronix offers DisplayPort Tx and Rx software solutions to help design and test engineers with electrical validation, compliance, characterization and debug. Our solution helps decrease overall compliance testing times – to less than 6 hours – and allows engineers to work on other tasks while the tests are running. Designers can characterize and margin their DisplayPort 1.4 and Type-C devices operating at 8.1Gbps with Tektronix’s Oscilloscopes and BERTs along with software analysis tools such as DPOJET and SDLA. MSO/DPO70000 Series Oscilloscopes for DisplayPort offer high Sampling Rate of up to 50GS/s per channel on all 4 channels. This helps in capturing all four lanes of DisplayPort signals and reduces the test times. DPO70000SX Series Oscilloscopes for DisplayPort offer lowest noise in the industry capturing signals with high accuracy. With a high bandwidth of 23 GHz and above, this series of scope meets the current DP 1.4 specification and is future ready if the data rates increase beyond 8.1 Gbps. This series of scope is also ready to meet the latest HDMI 2.1 display standard.